Is this a joke? Apparently not. A federal advisory panel is asking the FDA to ban Percocet and Vicodin because they contain acetaminophen. First, questions. Does this apply to Perocdan as well? 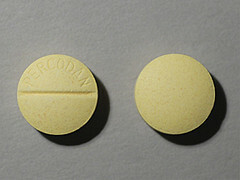 Percodan has aspirin and Percocet has acetaminophen. Is aspirin ok? I thought doctors liked to give out Perocet vs. Percodan because they said Percoet, with acetaminophen, was easier on the stomach lining.